Oversized styling and draped detail infuse vintage-chic vibes to this longline VINCE. 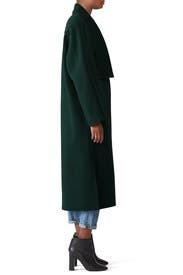 coat. Green twill (90% Wool, 10% Nylon). Coat. Long sleeves. Hidden front button closure. 47" from shoulder to hemline. Imported. This coat is amazing, I wish I could keep it! It's the perfect weight, unlined with a soft, almost felt feel. I'm 5'10 and the length is perfect just as shown in picture. Runs slightly large as with most Vince pieces. I had really high hopes for this but wound up sending it back unworn. The unlined, felt-y fabric clung to my clothes like Velcro, and it was too long and too shapeless. Color was beautiful, and it would be great on someone very tall. And nope, it didn&#39;t come with a belt. A belt might have saved it for me. Great quality, lines, and color. Modern. It has belt loops but no belt came with it. Other reviews said it's shapeless. So maybe no one got the belt. Retail pics show it with a matching belt. I still liked it with the belt missing. The wool is warm even though it's thin and not lined, but the open design at top and bottom means it's not gonna keep you warm in the dead of winter. I wore with a thin/short puffer under and it was good for a windy day in the 40s. I sized down and was glad I did, but belt loops were high. Way too big, and the belt was missing so I couldn't even adjust it to look cuter. It was super warm though. Definitely needs a belt. Not included. 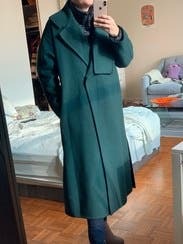 As others have mentioned, this coat is huge, but it's supposed to be. I liked that it fit beautifully over chunky sweaters, and how modern it looked. The hunter green color is pretty stunning as well. The only issue is that it is unlined (for that price point, it should be lined). At 5 months pregnant - the XS was oversized and unflattering. Pity, I loved the color. beautiful color and very warm. go a size smaller. A bit itchy and definitely oversized. It was a bit itchy since it's unlined. Because it's oversized, the cold wind would blow up the sleeves. I had to physically hold them closed to keep warm while walking through the city. Sitting indoors, I'd get pretty toasty. Fun, chunky, modern. Would definitely rent again. Wore this on a 40° day and definitely needed to layer up! There's no lining. 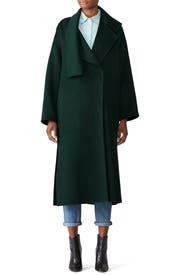 Beautiful coat, but way too big for me to wear. Love this coat and the color! 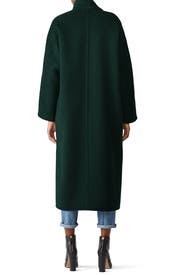 The coat is very oversized so I would suggest to size down to get a more flattering fit. I would get this again but in a smaller size. 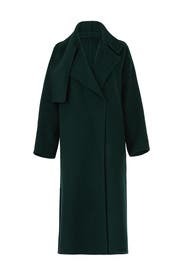 Note, based on other reviews seems like the coat has a belt although mine was sent without one.